SwingZing captures the Jump, Jive & Swing sounds of the 40s & 50s including Louis Prima, Louis Jordan, Fats Domino & Nina Simone to name but a few. The band features the vocal talents of one of the UK’s rising stars, Sinead McCabe, and some of the UK’s top musicians – Jeremy Huggett on tenor & baritone saxes/vocals, Gethin Liddington on trumpet/vocals, John Martin on piano/organ, Federico Leonori on bass and Eddie John on drums. 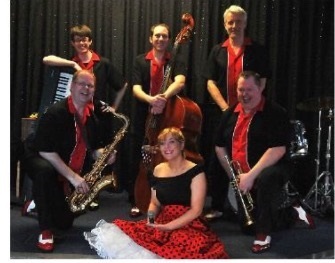 The exciting, lively sound and the versatility of the band is appealing to audiences of all ages making SwingZing one of the most popular bands in the UK and ideal for dancing.